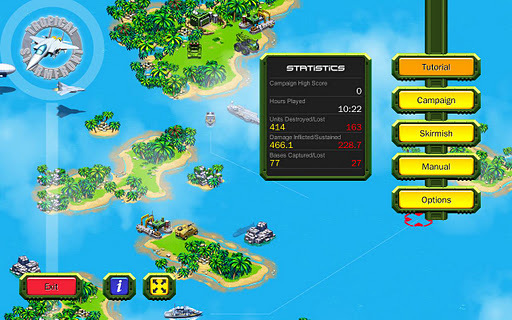 Tropical Stormfront is a new real time strategy game from Noble Master Games. 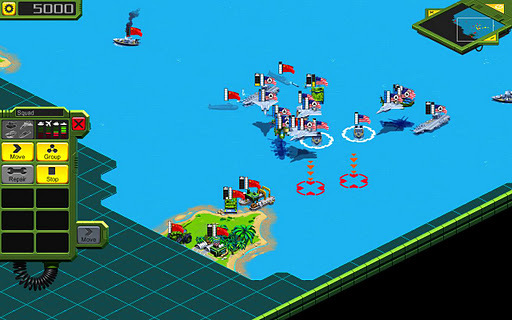 If you enjoy games commanding troops in battle and destroying your enemy, then you should like Tropical Stormfront. Make sure you do not walk away from a game, without pausing it. You will be sorry! 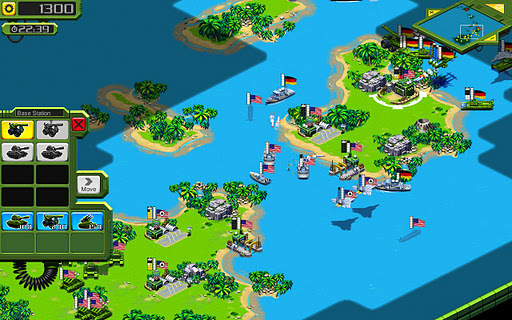 Many of real-time strategy games for mobile devices are not that great. Why? 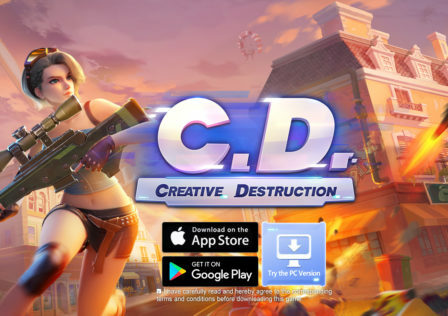 This type of games can have a lot of complexity and this can be hard to port to the mobile version. Not with Tropical Stormfront. I thought the developers did a nice job simplifying the game while keeping a lot of the strategic components intact. In the game there are only 12 mobile units (tanks, planes, subs, transports, and so on) and only 3 ground structures (base station, airfield, shipyard). If you wish to take over a ground structure, only your tank can do that. To earn money and build units, you need to take over the structures. This is where is simplest stops. Each mobile unit is good against certain type(s) of enemy units. The mobile units cost various amounts of cash and can only produced in certain locations. You lose ground structures, you loose money and mobile unit production. At first I had a hard time trying to figure out which units to produce and which were best against other units. Would have loved to have had a printable cheat sheet. When you are in the middle of an attack, you do not have a lot of time to be reading, you need to react. When you begin a skirmish, you have one base and from there you need to build tanks to take over the other ground structures on your island. Once that is done, then you can begin making units to defend you location, fight, and then invade your enemies. Once a unit is made, you can provide with “orders” such as move, patrol, repair, stop.To activate a unit, simply tap on it and then tap where you want it to go and or attack. Again very simple and nicely done. Once you have units all over the map, that is when things can get hairy. -Unit movement seems slow, but am assuming that is to give you time to manage your units and various battles. Tropical Stormfront is enjoyable and worth the price. The game works well on my Droid X and Asus Transformer tablet. I almost like it more on the tablet, due to the larger screen but it works fine on the phone. I really like the simplicity of game economy–capture the ground structure. This really allows you to focus in on producing mobile units, coordinating attacks, and defending your ground. You will find the game can be stressful at times as you can hear an attack going on, but you are not sure where. Also until you understand which units are best against which units, you will be scrambling at times. So are you ready to help the United Democratic Alliance (UDA)?